1/ Giving business a $65 billion dollar tax cut means billions of dollars less for schools, hospitals and other services. Giving business a $65 billion dollar tax cut means billions of dollars less for services like schools and hospitals. Treasury modelling even assumes these company tax cuts will be matched by cuts to services and higher taxes on people instead. 2/ The big four banks get an extra $9.5 billion dollars. Really. Australia’s big four banks are some of the most profitable banks in the world and are making record profits. 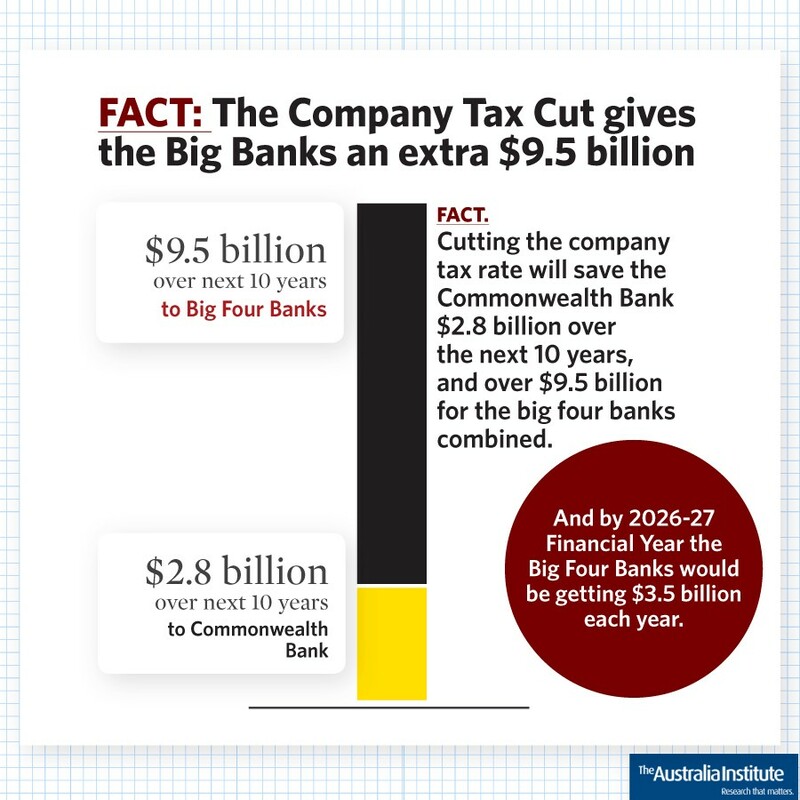 Our research shows the tax cut will net the big four banks an extra $9.5 billion dollars in the first 10 years of the tax cuts. Once fully operational, banks will receive $3.5 billion p.a. That’s right: $3.5 billion every year. 3/ The big winners are tax avoiders and foreign shareholders. The big winners from the company tax cut are tax avoiders and foreign shareholders. The benefits of the company tax cut mostly go to foreign shareholders, not to Australian shareholders due to Australia’s dividend imputation system. When the tax cuts are fully implemented, foreign shareholders will benefit to the tune of $3.7 billion every year. If Australian investors are the big losers why are the Business Council of Australia pursuing the tax cuts so aggressively? The BCA is funded by its members and even a cursory look at the BCA’s membership uncovers their true motivations. 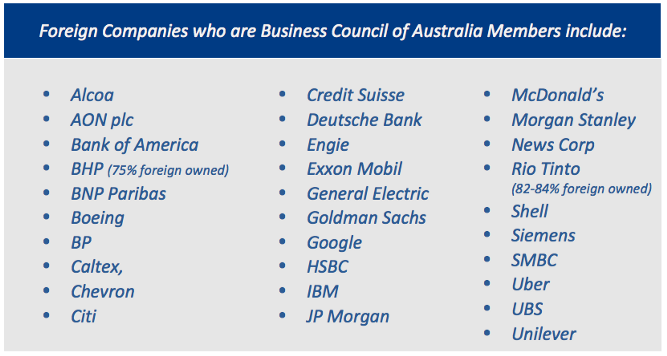 Is it the Business Council of Australia or the Business Council of Australian Subsidiaries? 4/ There is no correlation between lower company tax rates, employment, or economic growth. Are Coles or Woolies going to hire more checkout staff if they pay less company tax? Don’t think so. There is no correlation between lower company tax rates, employment, or economic growth. Common sense shows this, and historical and international data confirm it. 5/ Companies do business in Australia because they want to do business in Australia. Foreign investment isn’t dependent on the company tax rate. In fact, most of Australia’s foreign investment comes from countries with lower tax rates. 6/ Just 15 companies share a third of the benefits of the cut. Just 15 companies will get a third of the benefits from the company tax cut. Most of these companies are huge players in markets with few competitors (e.g. telecommunications, supermarkets), and therefore unlikely to change their hiring practices due to the tax cut. 7/ There are better ways to create jobs and help the economy. There are way more cost effective ways to create jobs and help the economy. Studies show that investing in schools and education is more likely to help the economy than giving businesses a company tax cut. 8/ The benefits are based on absurd assumptions (to put it lightly). The idea that cutting the company tax rate would suddenly cause multinational corporations to stop avoiding tax is ridiculous (optimistically termed a ‘morality dividend’.) This is just one of the bizarre assumptions in the economic modelling that claims to show company tax cuts help the economy. 9/ When will the company tax rate be low enough to satisfy big business? 10 big business CEOs joined with the Business Council to ask the Senate directly for the company tax cuts, which they assure us will go towards higher wages for workers. Our research shows not only have half these companies paid ZERO company tax in the last two financial years, but it’s also clear where the ‘higher wages’ are actually going. 10/ The public know it and CEOs privately admit it: the company tax cut will not increase wages or jobs. 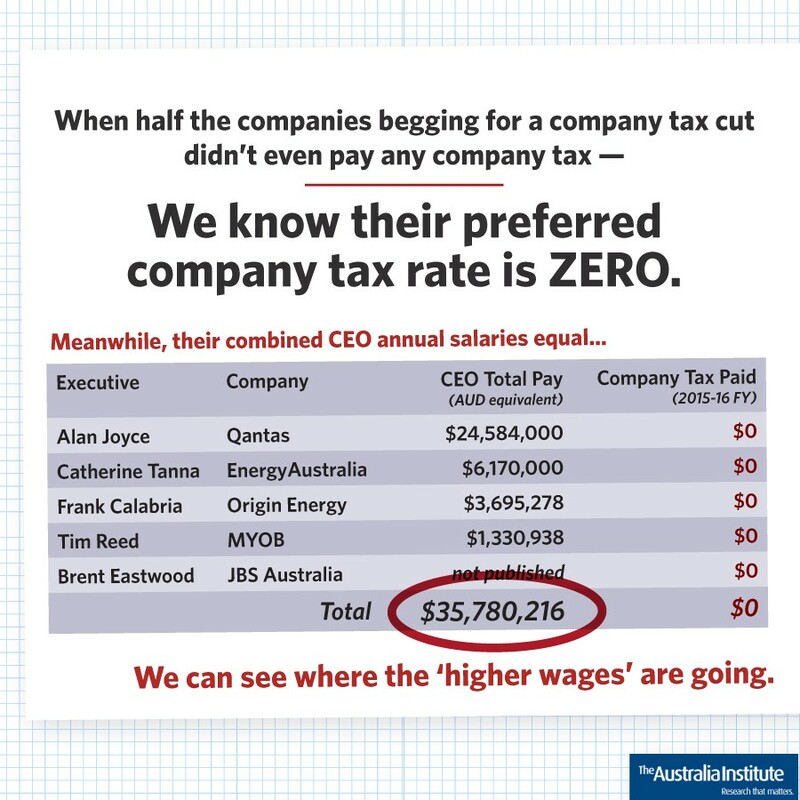 According to an AFR report, when the CEOs of the Business Council’s 130+ member companies were asked in a secret BCA survey to nominate one of four options as their preferred response to the company tax cut in Australia, only 17% nominated higher wages or more jobs. Over 80% selected either returning funds to shareholders, or more investment. 11/ What’s the rush? — If the tax cuts for big business don’t kick in for over four years, why do they need to be rushed through the Senate now? Why do we need a $65 billion dollar corporate tax cut right now? What’s the rush? While much has been written about the case for and against the cuts, the bigger economic and political question relates to why the Senate needs to rush through big tax cuts that won’t kick in for more than four years? Despite the fact that the cost of this legislation is 10 times as much as we’ve spent on the Murray-Darling Basin Plan, the government is determined to rush through the legislation in the next Senate sitting, despite it having zero effect on this year’s budget. 12/ We have the evidence from Trump’s company tax cuts — they did nothing for employment or investment. What did we see instead? An increase in mergers and acquisitions that benefit corporate executives and make big business even bigger. 13/ Vital public services and infrastructure will be the first to go. The United Nations has pointed out that following corporate tax cuts in America, welfare benefits and access to health insurance were slashed, funding ‘financial windfalls’ for the very rich. 14/ The company tax cuts aren’t even worth it. Even the Government’s own economic modelling shows that the benefits are tiny and over 20–30 years away. By then, we’ll have lost over $100 billion dollars that could have been spent on schools, hospitals, and other services. 15/ Voters don’t believe it will work or want the government to do it. 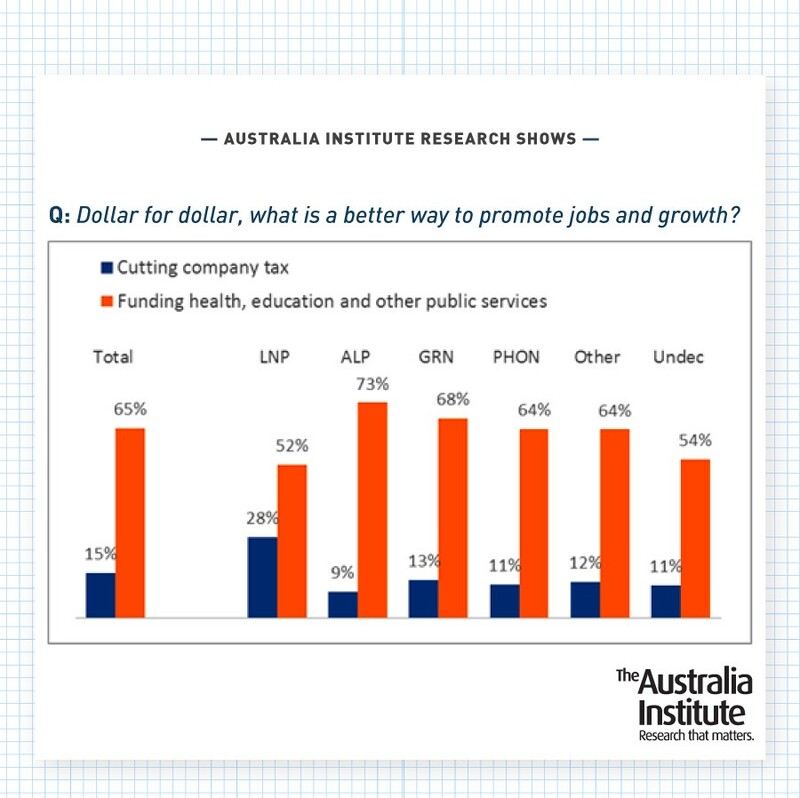 When asked, ‘dollar for dollar, what is a better way to promote jobs and growth’ a majority of voters — across all parties, including Coalition supporters — preferred funding health, education and other public services to cutting company tax. 16/ Not only do the economic claims not stack up, company tax cuts are political poison. 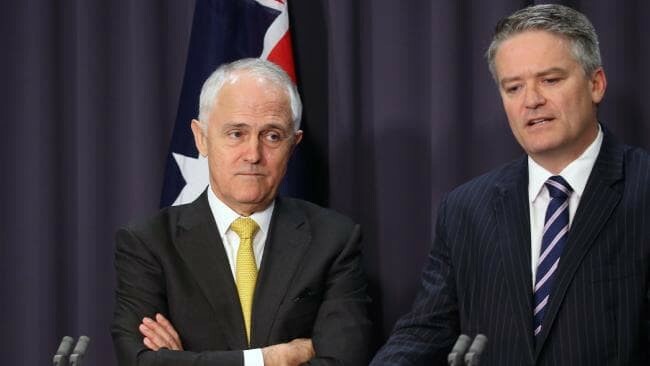 The Super Saturday by-elections showed that the company tax cuts are political poison with all of the winning candidates publicly and vocally opposing the company tax cuts. Polling consistently showed a majority of voters in Braddon, Mayo and Longman did not want company taxes to be cut and voters would much rather see that money spent on health, education and other services. Add your name to the open letter urging Prime Minister Turnbull and all political leaders not to cut taxes at this time — and certainly not for companies. Sign here. From all of the team at The Australia Institute, thanks for reading. We are able to do what we do because of your support. Subscribe to our mailing list to receive updates like this, straight to your inbox.